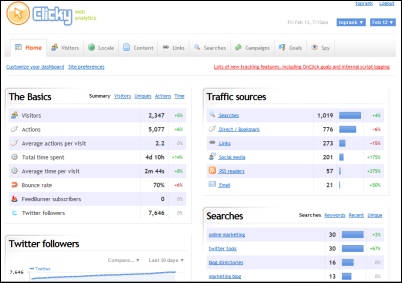 Clicky is probably one of the most popular blog analytics services besides Google and offers many standard measurement tools in real time as well as a spy feature. RSS subscriber and Twitter follower counts can be added to the main dashboard. Radian6 is not exactly a blog analytics tool in the sense of web analytics, but it offers tracking of what happens off the blog via social media monitoring, analysis and workflow – all in a visually engaging format. 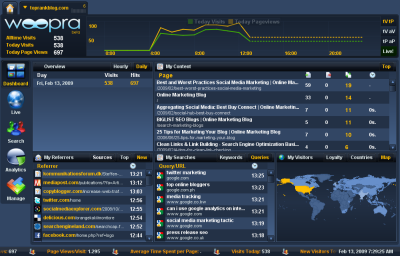 Having a hybrid web analytics tool combined with something like Radian6 would be a serious Killer App for the social web. Crazy Egg is a unique and useful tool for testing usability on web sites or blogs and ties on page activity with referrers. I include it in this list because of the Live reporting and visualization options that drill down to individual users. It’s most useful for determining where users click on “call to action” elements within your blog. Are they clicking on the RSS button or the text “Subscribe” more often. You can test quickly and easily. What blog analytics packages with rich visualization features have I left out? Would love to see suggestions in the comments. Came through from your Twitter update 🙂 I’d not heard of Radian6 before – but a tool to track social network activity surrounding a blog would be VERY useful, going to go look at it now, Recently signed up to Youmeo to try and get all of my networks in one place to make it easier to update – so thanks for the list really useful. Thanks, as always, for recommending Radian6. Appreciate that very much. I particularly love the CrazyEgg tool for my personal blog because of its “heat maps”. I haven’t decided yet whether it’s really useful or just cool, but I can’t help but enjoy seeing a different visualization of how my blog is performing. Thanks again for the mention, and for the pointers to some great tools for bloggers. I have been using crazyegg until now my second test wasn’t finished. I was able to modify my blog organization and neatness. Great post. thx for sharing. I will definitely try thr word press analytics…looks really cool! we have a full-time designer working on it, which i think shows, but then i’m biased! I been using Woopra for some months now. I really like it, sadly is in closed beta Status now. The next version (1.3) is coming soon and have some great advances over 1.2. Check out Concentrate from Juice Analytics, it categorizes and visualizes search keyword referrals from Google Analytics in the free version for bloggers. Thanks for the great list. Will definitely be checking out these tools. you made me think about Woopra again, thanks! Besides all the data: Could knowing the company names of the visitors come handy for lead generation in B2B? 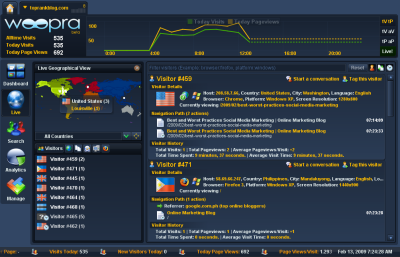 Another analytics service to definitely check out is Sysomos – sysomos.com – which offers an impressive variety of features to really monitor and analyze social media activity. Hey Mark. Another blog tool to check out that has an analytic component is Tynt Tracer. Add a line of code and it tells you what people are copying from your site. Thanks for the article, this was something I was looking for. The only thing I’d like make a comment is about woopra. I had registered with their website several times months and months ago, they never sent the confirmation code and they let you sign up but you can’t do anything. You just give away your email and password basically.